The 1151 Z170 Skylake Gaming Motherboards are still a solid choice for a good gaming setup in 2017-2018 as they were some of the first to switch to the new DDR4 standard. Skylake processors are still extremely powerful, so building off of a Z170 mobo could be the perfect choice for you if that’s the CPU-range you’re looking at. That being said, if you’re looking for some of the more recent options you can always check out our best motherboards for gaming article. What Is A Z170 Motherboard? The Z170 Motherboards, is a LGA 1151 socket compatible motherboard. Compatible with Skylake and Kaby Lake processors. These motherboards are still some of the most powerful around, and to put this in perspective, we often tell friends that LGA 1151 is better than 1150 which in turn succeeded the famous LGA 1155 Ivy Bridge & Sandy Bridge socket motherboards. There’s no doubt that processors have got a lot more powerful even over the last 10 years, and motherboards have had to keep up with that. The Z170 200 series chipsets (Kaby Lake) were introduced in the first quarter of 2017. So as of this time of writing, the Z170 motherboards are the ideal budget motherboards for the most recent Intel processors as these use the LGA 1151 socket. This means that whether you’re looking to fork out on a powerful Kaby Lake CPU or a less expensive, but still powerful Skylake processor – the Z170 can accommodate your plans. These motherboards as of right now are the most versatile for high-end gaming specs as well as entry-level high-end gaming builds. In our list, we’ve included our top three Z170 Motherboards for gaming. We’ve included the reliable, the powerful and the budget options – but what they all have in common is they will provide a great base for any gaming setup, whether you want to upgrade later or simply build out a powerful system that won’t cost thousands. This is a solid Z170 motherboard which offers everything that you would expect of one of the top motherboards in this range. It supports up to 64GB of DDR4 RAM, has 3 PCI-E 3.0 x16 Slots and 4 PCI-E 3.0 x1 Slots which is ideal for gaming. Most MSI motherboards are considered to be exceptionally good, and this is no exception to that general rule of thumb. It’s got a good solid design, with customizable LEDs for those that are more ‘design’ conscious. In terms of looks it’s definitely up there, but you do expect that at this price. While it has pretty much all the same features as other motherboards on this list, it’s performance is far better for overclockers, and let’s face it most serious gamers are going to be doing some overclocking. So paying a bit extra might be worth it for those who are interested in that. Is the MSI M7 Z170A worth it? Most definitely yes. We put it at number four on our list because of it’s excellent value for money. It’s also more than capable of running a very respectable gaming build. There isn’t a huge deal of difference between this motherboard and the fourth placed motherboard on this list. Both are great motherboards, and most people choose between the two based on brand-preference. We personally place this higher as it supports more memory modules. This means that you have more customization over your build which is generally our preference. Is the GIGABYTE GA-Z170Z Motherboard worth it? We think so, as we said there’s not a lot that separate this motherboard from our third placed pick. Both have similarly good reviews, both are from great brands and we personally had no problems with either of these boards. This board has more flexibility for those who like to add components to their systems regularly. That’s the main difference for us. This is our top pick for the best Z170 motherboard title. The ASROCK FATAL1TY Z170 is a full ATX mobo that supports up to 64GB of DDR4 RAM. It’s got a neat and stylish design, and overall as motherboard we found it to be very stable when we tested it out. For the price this motherboard is really a wonderful purchase for a budget Z170 Motherboard that offers all the functionality you’d expect, while offering good stability and longevity. The only downside over some other motherboards in this list is that it only has 3 functional PCI-E slots. Which could be an issue for those who have the need for four. 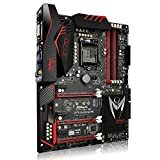 Is the ASROCK FATAL1TY Z170 Mobo worth it? It’s a solid motherboard for the price, and for under $200 it’s the best budget Z170 motherboards we’ve come across for overall performance. Don’t let the price fool you though, it’s absolute quality and we’d only recommend you look elsewhere on this list if you need more PCI-E slots or more overclocking features. The best Z170 motherboard depends on your needs, but any on this list is going to allow you to use Skylake, Kaby Lake CPUs by Intel. Finding the perfect choice is about weighing up the pros and cons of your needs, budget and planned usage. If you’re looking for a board that’s slightly more powerful than the ones in this list, you might want to take a look at our review of the best z270 motherboards, these more recent mobos offer native Kaby Lake support and are generally a better option for those looking to upgrade their system regularly.